I awoke to the sound of the bikes leaving and one of them calling out to me that it was time to get up! They had an Arctic Ocean tour booked that morning at Deadhorse and needed to be there by 10.00AM. I was staying there the night with a tour the following morning so had more time to make the 150 or so miles left on the highway. Pulling out of the campground I saw that Jay, Steve and Chris had not made it very far and were fixing a tire. Rick had left a little earlier unaware of their delay. Some time later the three passed me apparently having patched the tire but about 69 miles from Deadhorse there they were by the road mending it again. They said that someone had spotted a muskox and many caribou in the vicinity so I kept my eyes open as I proceeded onward. A few miles later I pulled over to take in the open expanse of arctic tundra that lay below me and scan the horizon for muskox. As I was pulling out my binoculars Steve pulled up and asked if I was feeling hospitable. I asked what he needed and he said that Jay needed a lift to Deadhorse because he wasn’t able to repair the tire anymore. I said OK and drove back to pick him up. We strapped the wheel on the roof and left the bike by the road where he could return assuming the tire could be repaired in Deadhorse. Not much later we passed a truck coming the other way that didn’t or wouldn’t slow down for us and the Land Cruiser suffered a cracked windshield from a flying rock as a result. I have to say that most truck drivers have been very courteous so far, slowing down when they see you have pulled over to give way. Until now, the only vehicle on the highway that didn’t seem to pay much attention to other vehicles was a minivan! Arriving in Deadhorse around 1.30PM I had reached the end of the James Dalton highway. 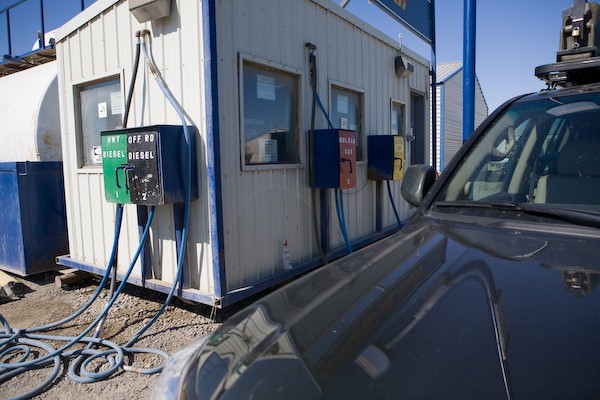 I checked into the Arctic Caribou Inn and after shuttling Jay and his tire to the repair shop I found the gas station which was a little different to the ones we are used to as you can see below! Rick and Steve left mid afternoon and I dropped Jay at the Dalton where Chris would wait with him to see if he could get a ride to his bike. Chris would then ride with him in case the tire didn’t hold. Later that evening there was a knock on my door. Jay had been unable to get a ride so it looked like I was his best option to get to his bike tomorrow. He had found a room at the other hotel in Deadhorse and I would pick him up after the Arctic Ocean tour I was taking in the morning.